Starting out on your own as a contractor is an exciting time but it can be a little daunting. Having your first contract lined up will help. But even if you take the first step into contracting with a contract ready to start, how do you ensure you have a steady flow of work in the longer term? It can be easy to focus on the job in hand when you begin contacting. You’re working for a new client and you become immersed in the project you are working on. As a contractor, part of your role as your own boss is to ensure that you have new leads to other contract before your existing one finishes. You need to ensure that the flow of contracts fits with your needs. If you enter contacting after a prolonged career you may have a large network of contacts to tap into. You could try to source contracts direct through your contacts but this can be limiting. Independent professionals often come across barriers to entry if the companies they are trying to target are large corporates with centralised procurement functions. The majority of contractors find one or two agencies with which they work with regularly and build strong relationships secure upcoming roles. You outsource the task of finding contract work to the agency but you still need to ensure you nurture the relationship and steer the search to further your career. Having a good relationship with your agency is the most productive way of sourcing future contracts and you can read more about this in our article about the benefits of using an agency. A killer CV – a contractor’s CV needs to be so much more than a record of the roles you’ve had. It’s the main sales tool you have to secure contracts. Your CV needs to show that you deliver – clients want to know what you deliver. LinkedIn – people buy people, you’re more than a service provider and clients like to see you are connected and active in your field of expertise. Having a solid LinkedIn profile is the first step; posting regular and pertinent updates elevates your status to the next level. Presence – networking can take many forms and as a contractor you need to ensure that you spend time nurturing relationships. This can be done through membership of associations and trade bodies through to networking and trade events. Want to know how to find more and better contracts? Core marketing tools – your CV and professional profile. Relationships – building your network and agency relationships. Contract satisfaction – find the right contract for you. 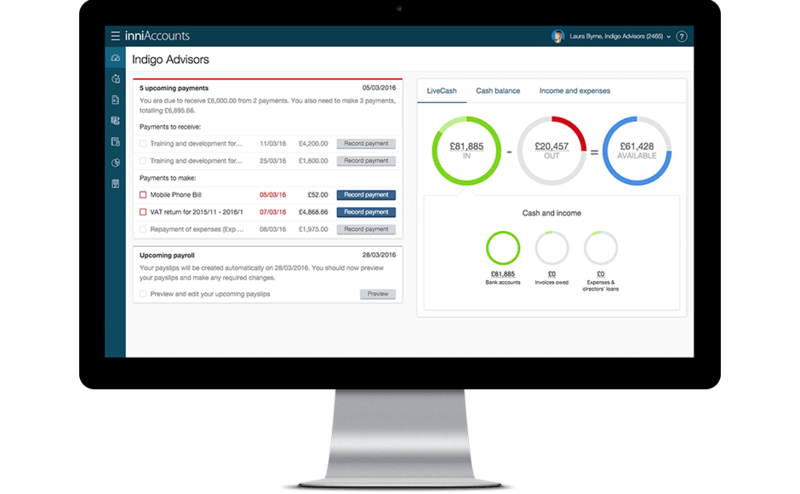 Take a demo tour of inniAccounts and find out how to stay on top of your business finances, so that you can plan for the future!